The first full length three act play produced by the Society was the comedy “The Blue Goose” on Thursday 20, and Friday 21 May 1948 at the Theatre Royal. With Sir Laurence Olivier strenuously endeavouring to create additional interest in the Australian stage, the Townsville Theatrical Society selected an appropriate time to present its first full-length play at the Theatre Royal last night. The society pursued the correct policy in finding its theatrical legs with a series of one-act plays, but the public showed its appreciation of being given the opportunity to enjoy more satisfying stage fare by packing the house and were rewarded with splendid entertainment. In fact, the size of the audience, for a first night, demonstrated that the living theatre is now firmly established in Townsville. In presenting 'The Blue Goose' a three-act comedy, the society made a happy choice for its first major effort. The players revelled in light comedy that at times approached farce— an angle that could have been stressed to advantage. However, bright dialogue and good timing by the performers quickly captured the audience, and the first-act in particular produced one long ripple of laughter. 'The Blue Goose' is a domestic comedy with a strong municipal and nautical background. The father of the family is treasurer to a borough council in England. His wife believes she can sing, and insists on her two daughters joining her in local concert acts. One daughter is engaged to the mayor, an ex-jockey, who is the local undertaker: the other daughter falls in love with a world-roaming yachtsman who happens to visit their seaside town, and who with the widow of an admiral of the Fleet, provides the seafaring atmosphere. All the ingredients to produce rollicking comedy were in evidence, and the players fully exploited every opportunity to produce good fun. Again the Townsville Theatrical Society demonstrated it can call upon a remarkable range of outstanding talent. Shirley Davidson, as the wife, gave a performance that was faultless. She had a difficult role to sustain, yet never lost her sense of timing, clowned when the occasion demanded and fairly romped through her part. Sadie Williams, as the admiral's widow, turned on a boisterous character act that gave her an out-size share of the laughs. Bert de Villiers, a newcomer strode the boards with aplomb. He has an excellent sense of comedy, with a flair for pantomime that would make him a 'riot' in straight-out farce. His 'drunk ' scene was perfect. Jack Ashe, as the seafaring man, gave another smooth performance for the society. He has a quaint method of handling love scenes, treating his sweethearts with a matter-of-fact air that is most engaging. He has a new ‘line' that is very intriguing in stage work, and has the air of a veteran. Jack Butler, another newcomer, as a council clerk, gave a performance that was a model of restrained acting. Many a more experienced player has over-played a similar role. More should be heard from him. The two daughters, Nina O'Sullivan and Helen Thomson, gave polished performances in roles that gave them little scope for their proven talents. Nina O'Sullivan displayed an unsuspected aptitude for comedy, which, it is to be hoped, will be given wider opportunities in the future. Colleen Remilton, as the maid, had little to do, but handled the part like a veteran. She should shine in a low-comedy role. Chris Lander, as the father, and Fred Whitchurch, as a lifeboat man, did well at their first appearance and maintained the even ability shown by the company. 'The Blue Goose,' which will be presented again to-night, can be recommended without reservation. If entertainment can be measured by the humour it can produce then the play measures up to top standard. No similar theatre group in Australia could give a move even and excellent performance; Townsville should be proud that it is capable of staging such a show. Applause at the conclusion last night was spontaneous and prolonged. Scenery, settings and make-up, were outstanding and a credit to those concerned. 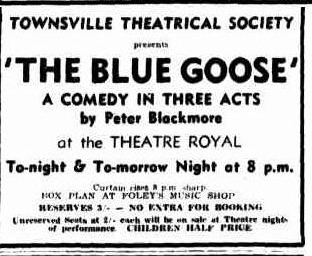 When the Townsville Theatrical Society staged the “The Blue Goose” last week, there was considerable comment on the excellence of the settings. And they were outstanding. A coastal scene, way beyond a window at the back of the stage, created a perfect allusion of looking at a rocky point on a coast from a room some miles away. The people behind the scenes are highly important in stage productions. Mr G. Wiedemann and his assistant Mr W. Hammond have reason to be proud of their efforts with scenery and sets in the “The Blue Goose”; the same applies to Mrs Rita Jell, who handled the make-up for the entire company.